An important part of each month's program is the Guest Speaker. 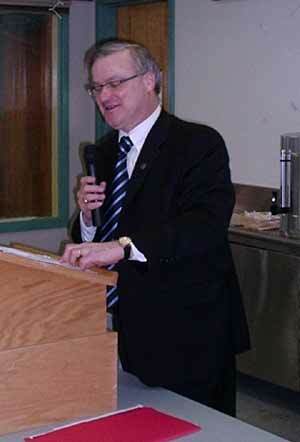 To view a list of previous Club Speakers, please click HERE. Suggestions for Guest Speakers may be forwarded to the webmaster. Our special speaker for the Feb. 21, 2018 meeting was Keith Dow. 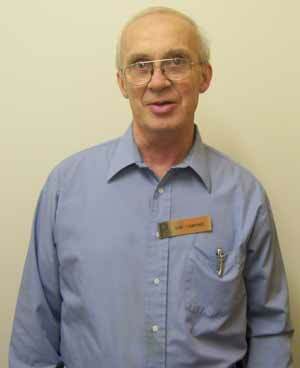 Keith spoke on the events surrounding the 1755 expulsion and 1764 return of the Acadians. An active question period followed. 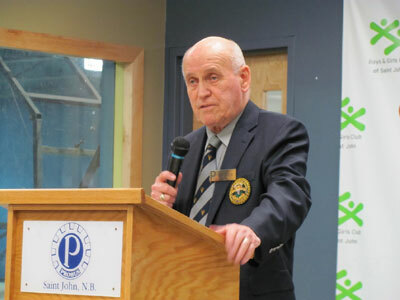 Past President Ralph Wood introduced our guest speaker, Victoria Clarke, Executive Director of Discover Saint John, although she stated it should be �Greater Saint John� based on what was involved. John Doyle thanked Ms. Clarke for her talk, presenting her with our Club Anniversary mug. The guest speaker for the Nov. 15, 2017 meeting was Michael Griffin. Michael, a long-time volunteer for the Seafarer's Mission, spoke on behalf of the Saint John Seafarer's Mission, relating their many services to the maritime community. 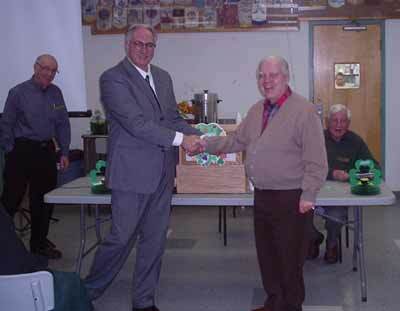 Vice President John Doyle (right)thanked Michael Griffin for his address, presenting him with a PROBUS mug in appreciation. On Oct. 18, 2017, there was no monthly meeting at the usual place. 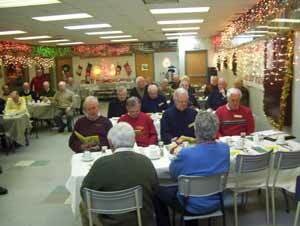 Instead, the Probus group went out on a tour of a local industry just a few miles down the road from Saint John. The place was CONNORS BROTHERS sardine factory located in Blacks Harbour, NB. 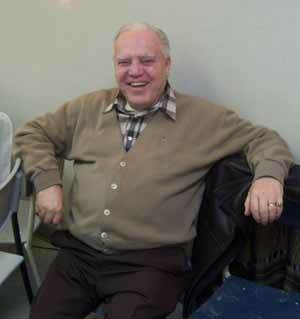 The tour took place on October 18th and was arranged by our president, Ed O'Keefe. On a head count we had about 22 persons. 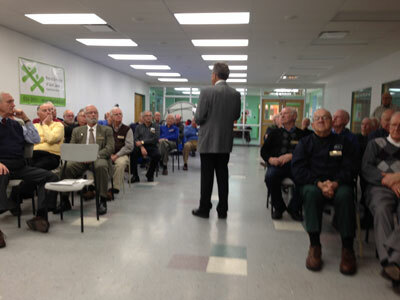 Some members could not attend because of the amount of walking required. The tour was most interesting and what a lot of members were saying, is the plant was much larger that previous realized with many product lines in operation.  It is a major employer in that region. The tour lasted about 1.5 hours. PROBUS would certainly like to thank the management of Connors Brothers for their hospitality. The plant was very clean. After the tour, several groups went to the local Restaurant in Penfield or St George for lunch. 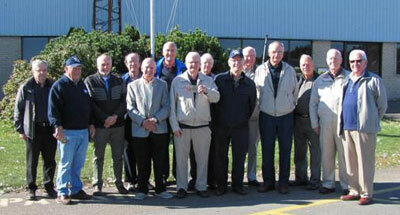 Thomas Craig, David Ellis, Ron Pearce, Robert Taylor, Wes Cosman, John Doyle, Fred Shillington, President Ed O'Keefe, William Covert; Dale Steeves, Barry Watson , Murray Driscoll, Fenton Keirstead, Ron Lister. 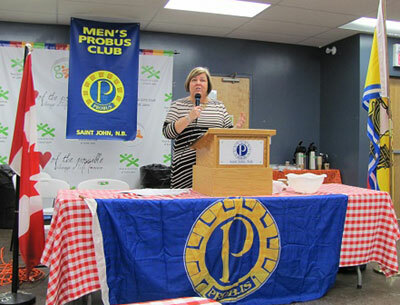 At the Feb. 19, 2014 monthly PROBUS meeting, the speakers were Victoria Clarke and Jeff McAloon of the Saint John Regional Hospital Foundation. On Jan. 15, 2014, Mayor Mel Norton updated the Clubon the City's progress and intimated some interesting developments for the future. At the meeting a new club constitution and by-laws were adopted as well. 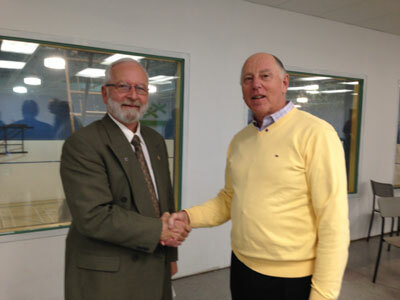 Gordon Dempsey(left), Past District Governor of Rotary, was pinned during the Oct. 2013 meeting. In Nov., Gordon congratulates Kendall Higgins who was pinned in Nov. and was sponsored by him. 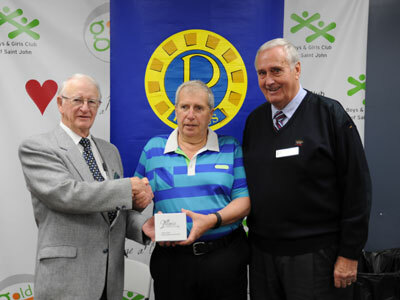 Welcome to Probus gentlemen ...way to go Gordon at this rate we'll be looking for a larger meeting place soon. 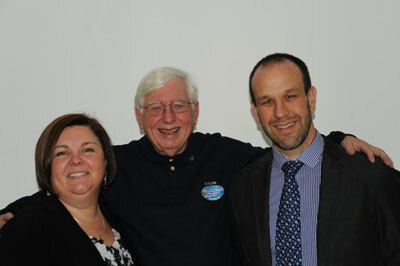 Jim Quinn (left), CEO of the Port of Saint John, was our Nov. speaker.He was enthusiastically welcomed. Question period had to be curtailed as lunch was getting cold. Thanks Jim for an excellent update on our port. Members (right) paying rapt attention to our November Speaker Jim Quinn. 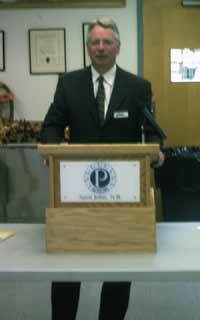 Vaughn McIntyre, guest speaker for Oct. 21, 2009 meeting. 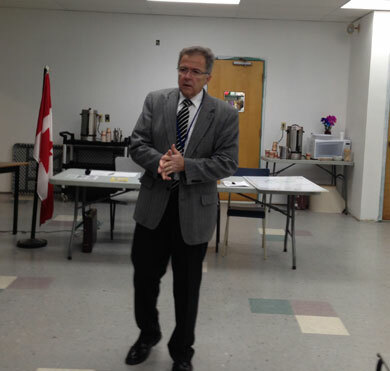 Mr. Roger Haineault, a tax consultant, was the guest speaker for the meeting on Mar. 18, 2009 and was introduced by Don Thomkins. 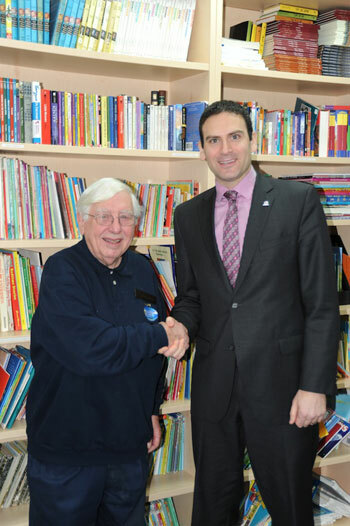 Mr. Haineault then proceeded to outline various new measures in recent Federal and Provincial budgets that could be advantageous to us as senior citizens. There was also some explanation of the circumstances that have led to the current recession and measures that have been introduced to ameliorate them. A lively and informative question and answer session followed the presentation. Mr. Haineault (left) was thanked by Clarence Blois(right) seen shaking hands and the meeting adjourned for lunch at 12 noon. In the back ground to the left is 2nd Vice President Bob Capson, and Phoghorn editor Ralph Wood. The Club's guest speaker was Dr. Robert MacKinnon, (left photo), Vice President of UNB Saint John, who gave the Club an update and overview of the University with particular emphasis to the new School of Medicine. 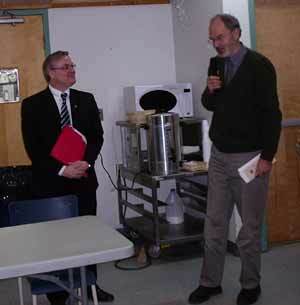 In the photo to the right is new club member Dr. Barry Beckett thanking Dr. MacKinnon for his informative talk. 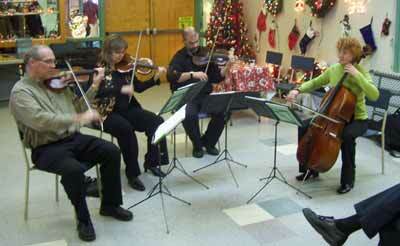 At the Dec. 17, 2008 Christmas meeting, the PROBUS members were entertained by the Saint John String Quartet (top photo) comprized of David and Sonia Adams, Chris Buckley, and Christine Gail-Harrison whose seasonal presentation was a delightful combination of carols and seasonal music with interesting comments on the origins of each piece. The members were then served a fine Christmas lunch by the Boys and Girls Club staff and the members adjourned full of Christmas cheer. 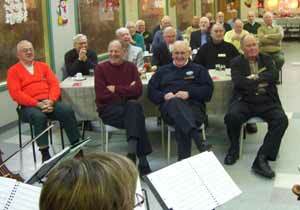 Pictured in two bottom photos are PROBUS members listening (left), and enjoying a sing song. 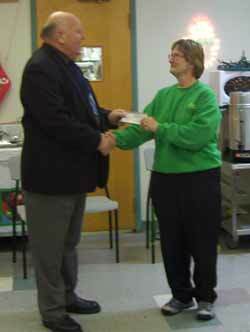 During the meeting, President Richard Burpee presented Debbie Cooper, the Executive Director of the Boys' and Girls' Club, with PROBUS' annual Christmas cheque. Clarence Blois (left), the Club's Entertainment & Singing Chairman, shares a laugh- maybe at the quality of the singing that day! Don Tompkins (right), isn't quite sure what just happened. He has just taken over from long time historian Lou Duffley as the Club Historian and Photogragher, and will be prime for forwarding material to Club Webmaster Robert Lockhart for the web site. Click HERE to view history of monthly programs & Guest Speakers.